On July 2, 2013, Otavia reached her goal weight. 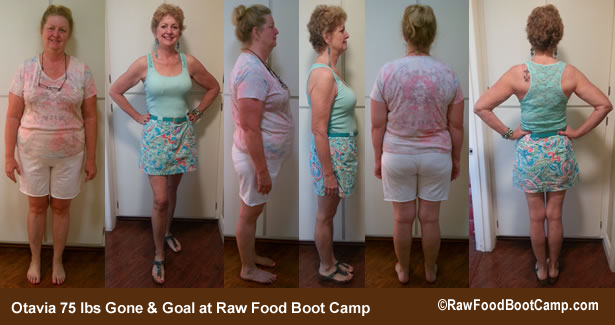 She swore that day that she would stick with Raw Food Boot Camp and the support we offer for one full year. She kept her promise. She wasn’t at camp every day. She didn’t log her food every day. But she was there a lot and always remained honest with what she was eating, even when she knew I would be on her about it. 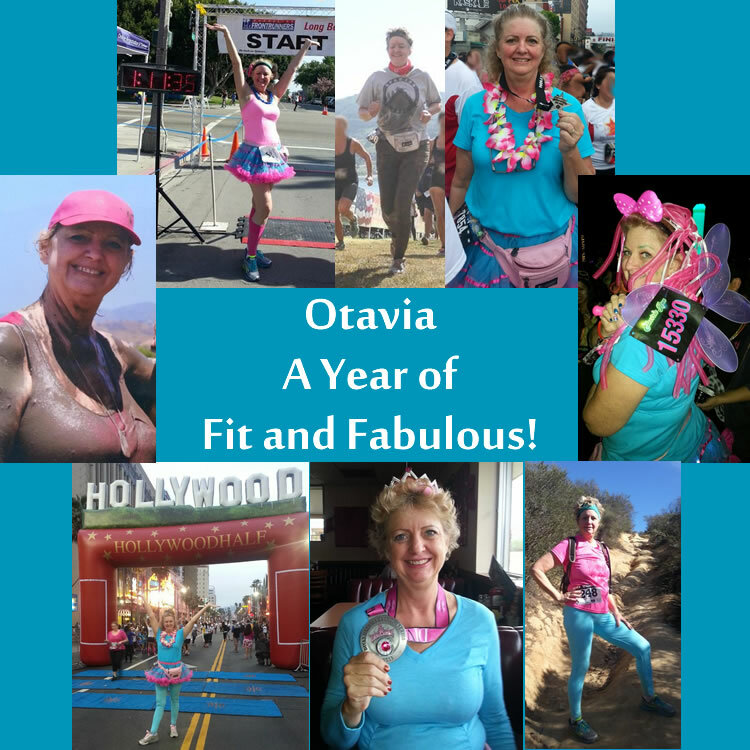 In January 2019, Otavia wrote to Carlene to say it had been 5 years since she hit goal and she was still within 18 lbs of Goal. Her plan was to drop 10 of those pounds and then keep doing what she was doing. She is not living on a 100% raw diet. She eats lots of fruits and veggies each day and then eats an omnivore diet of whatever she wants in moderate portions. She maintains her calories between 1200-1800 a day, and even has a glass or two of wine here and there. She’s far from perfect, but what she does have is the desire and determination to make this work for her for life. She swears she will never be obese again. How she keeps this in the forefront of her mind is that she has stayed accountable at Raw Food Boot Camp, participates on a regular basis inspiring everyone with her wisdom and wit, and once a month she participates in a fun run of sorts. Obstacle courses, Electric Runs, Mud Runs. Below is a collage of some of the photos she’s sent over the past year. Maintaining weight is a whole process in and of itself that needs to be learned. I was just talking to my sister over the weekend. She is struggling, she has released 38# and just got into Two-Town….I can’t seem to get her to join RFBC….but I feel confident that she will reach the conclusion that it is a darned good place to be. She is doing Weight Watchers. It has taken her 8 months to release not quite 40#’s. Anyway….I have found the key to releasing weight, is to JUST DO IT! All diets work if you just follow them….some just work faster than others and are easier to convert to a “normal” lifestyle. If you wander off the path, if you trip, if you fall off the path….heck if you run off the path with a machete in hand trying to create a new path…..just keep getting back onto the beaten path, because WE KNOW IT WORKS! If you continue to make the right choices….results have no choice but to follow. Remember the fish will always follow the head. I will be here at RFBC for some time to come. I have realized (CRAPPOLLA) that my obesity is only in remission right now, and it has not been cured 🙁 I need to stay until I no longer have a FAT BRAIN. My biggest challenge is to maintain awareness of satiety and put something down, put it away or throw it away once I am satisfied……overall I feel I am making good food choices. I have realized that during this journey my tastes have actually changed! That is a good….NOPE….that is a GREAT thing! My goal is for the rest of my life to continue eating 80% fruits and veggies everyday (not necessarily raw) and the other 20% low fat, low sugar, low sodium. I WILL BE FIT AND FABULOUS FOR THE REST OF MY LIFE!